Prof. Johannes Herrmann, a researcher at the Technische Universität Kaiserslautern, Germany, and his team discovered a novel mechanism by which newly synthesized proteins reach their respective target compartment in the cell. Proteins destined to mitochondria, the cell's powerhouse, are not directly transported to mitochondria but are directed to the surface of the endoplasmic reticulum, where they "surf" along its surface. As shown in Science, this so far unknown mechanism keeps newly synthesized protein transport-competent and might prevent their aggregation. Protein aggregation can be a critical problem leading to human pathologies such as Alzheimer's or Parkinson's disease. Mitochondria, the compartments that produce most cellular energy, contain surface receptors that facilitate protein uptake. "These receptors specifically recognize mitochondrial proteins and direct them through pores into the interior of mitochondria," explains Prof. Johannes Herrmann, a specialist for mitochondrial biology. "But so far, we had no idea what these proteins encounter before they reach the mitochondrial surface. It was just assumed that newly synthesized proteins are directly targeted to their destination compartment." 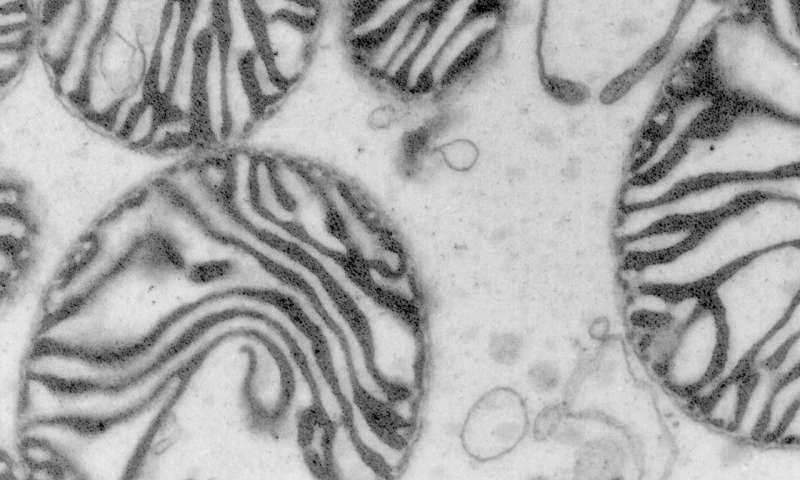 In a close collaboration with Professor Maya Schuldiner from the Weizmann Institute in Rehovot, Israel, Herrmann's team observed that mitochondrial proteins are initially targeted to the surface of the endoplasmic reticulum (ER). The ER is a cellular compartment that serves as a central sorting station to deliver proteins to various cellular structures. The new import pathway is called ER-SURF, "since proteins basically surf along the ER surface," explains Katja Hansen, a Ph.D. student in Prof. Herrmann's lab and first author of the Science paper. Hansen established a genetic screen to identify novel components relevant for intracellular protein transport. She explains, "We were able to identify specific ER-associated proteins as being critical for the transport of proteins to the mitochondrial surface." The ER serves as a buffer system. "The newly synthesized proteins, often prone to misfolding and aggregating, are bound and stored on the ER surface until they can be passed on to mitochondria," explains Herrmann. "Thereby, ER-surf maintains proteins in a transport-competent conformation and prevents their aggregation. Such protein aggregates can be detrimental for cells and are thought to underlie the development of many diseases." Herrmann's team will now try to unravel the relevance of their ER-SURF mechanism in the context of human diseases. "In particular, neurodegenerative disorders such as Alzheimer's or Parkinson's disease are caused by accumulating protein aggregates," says Herrmann. If the mechanisms that lead to the formation of these aggregates are better understood, we might be able to identify strategies to treat and cure these diseases. Further studies are needed to unravel whether the ER-surf pathway is also relevant for the targeting of proteins to other cellular compartments.